Leading Index - China is starting to turn around as the government stimulus is working. Dollar denominated exports increased 14.2% in March on a year over year basis. That almost doubled estimates for a 7.3% increase. The weak part of this trade report was that imports fell 7.6% which missed estimates for a 1.3% decline. Because exports destroyed estimates and imports missed them, the Chinese trade surplus was $32.16 billion which beat estimates for $6 billion. Another catalyst for the Chinese economy will be the trade deal with America. Because of this report, the IMF’s prediction for GDP growth increased from 6.2% to 6.3%. China’s GDP growth for the year isn’t as important as figuring out when the cyclical downturn ends. The long run trend is lower, but there will be periods were growth is either stagnant or increases slightly. That slight increase could occur later in the year. Jobless claims in the week of April 6th fell to a new cycle low. Claims were 196,000 which was much lower than the consensus for 211,000. Last week, the data from California was estimated, meaning we weren’t sure if it was accurate. The report was only revised 2,000 higher to 204,000 which is still extremely low. Specifically, claims of 196,000 are the lowest since late 1969 when the labor market was about half the size. Keep in mind, that it’s harder to get unemployment benefits now. That makes this report less amazing, but still solid. The 4 week moving average of claims fell from 214,000 to 207,000. That beat the cycle low of 210,500 that was hit last September. The year over year growth in 4 week claims fell from -3.9% to -7.6%. To be clear, claims are also low on a non-seasonally adjusted basis. That’s worth noting because of the late Easter. Last year Easter was April 1st and this year it is April 21st. Finally, to cap off this great report, continuing claims fell 13,000 and the 4 week moving average fell 11,000 to 1.734 million. Leading Index - ECRI Is Now Bullish! 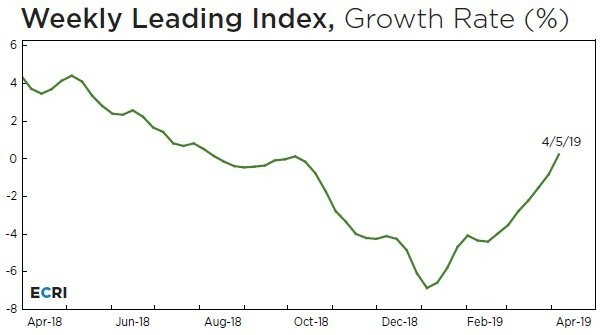 The ECRI leading index has been spiking since the start of the year when growth bottomed at -6.8%. As you can see from the chart below, in the week of April 5th, the leading index’s growth rate increased from -0.8% to +0.2%. The growth rate was up 1.1 points and the overall index was up 1.1 points. The overall index is now at 148.1. It peaked slightly above 152 in early 2018. Many bears have followed this report because it has been negative for the past few months. They are now criticizing it because it doesn’t agree with their worldview. It’s a big mistake to seek out information to support your opinions. You should approach the market with an open mind if you want to do well. The bears’ biggest criticism of this index is it is being pushed higher by the stock market. The stock market is traditionally thought of as a leading indicator. However, it is sometimes wrong. Bears obviously think the market is wrong. Hence, that makes them refute this index’s big change. To be fair to the bears, ECRI the company hasn’t switched to being bearish. They rely on other private indicators to formulate their opinion. That being said, ECRI is going to be pressured to go bullish on the economy if this index’s growth rate continues to improve. Next week, the March coincident index will come out. Since the economy is still in a slowdown, I expect that index’s growth rate to fall again. From December 2018 to February 2019, the growth rate fell from 3% to 2.2%. That’s still above last slowdown’s trough. In early-mid 2016, growth fell to about 1%. If growth in this index bottoms soon, it will support the narrative that this slowdown wasn’t as bad as the last one. 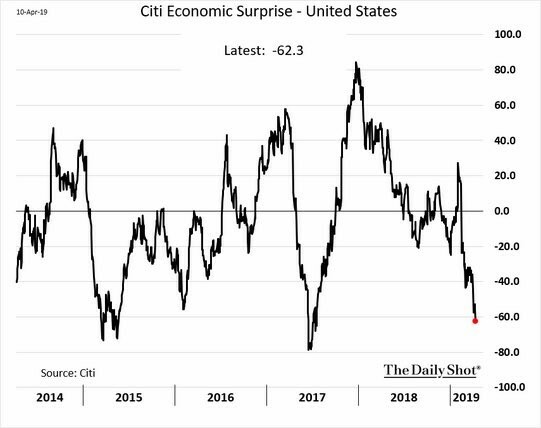 Citi surprise index shown in the chart below is the exact opposite of the ECRI leading index. This index isn’t as meaningful as ECRI. As you can see, America’s surprise index is -62.3. This index is highly sensitive as I’ve seen situations where growth was improving, but the index was negative. One recent example is the summer of 2017. This index is simply a summary of how the recent reports have done. Even though they have missed estimates, the stock market has roared higher. Investors are betting on future reports, in the next few quarters, beating estimates. As of April 10th, the median of 11 estimates show Q1 GDP growth will be 1.6%. If you would have told most investors on December 24th, which was the day stocks bottomed, that Q1 GDP growth was going to be 1.6%, they would have bought stocks. Leading Index - The quarter isn’t living up to the pessimism of late last year. It will be up to the next few quarters to live up to the optimism this rally has brought. St. Louis Fed’s GDP Nowcast shows Q1 growth will be 2.2%. This Nowcast is usually very optimistic. It’s a bit below where I would expect given the consensus. Atlanta Fed Nowcast is the most optimistic of the Fed estimates as it is projecting 2.3% growth. Manufacturing report on April 8th caused the contribution of inventory investment growth to increase from 0.15% to 0.24%. Finally, the NY Fed’s Q1 Nowcast stayed at 1.4% this week. It’s the most pessimistic of the bunch. Even though the ECRI leading index implied the economy would be terrible in Q2, the NY Fed’s Nowcast calls for 2.05% growth as the estimate increased from 1.95% last week.